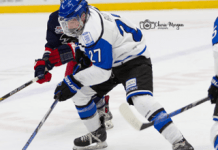 Penticton, BC: The Penticton Vees are pleased to announce 2002-born forward Cole Shepard has committed to play NCAA hockey for the Harvard University Crimson in the future. Shepard, from Vancouver, suited up for six games with the Vees this season, two in the regular season and four in the playoffs against the Trail Smoke Eaters. He registered his first career BCHL point with an assist against the Wenatchee Wild January 6. For the majority of the 2017-18 season, Shepard played for the Delta Hockey Academy prep team scoring 19 goals and 34 assists in 33 games. His total put him atop his team in scoring and tied for 11th in the Canadian Sport School Hockey League. The Crimson are a member of the ECAC and play their games out of the Bright Hockey Centre in Cambridge, Massachusetts. One former Vee currently plays at Harvard, Lewis Zerter-Gossage who spent the 2014-15 season in Penticton. Another Vees alum who played for the Crimson is Eric Kroshus, who was a member of the 2008 Fred Page Cup championship.